My wife and I have been “unwinding” every night to the Olympic Games. Oh, to be that young again and have the energy, drive, stamina, and guts to try some of those amazing feats. What am I talking about? I didn’t do it the first time. Why would I do it if I could go back? Anyway . . . I am so amazed by these sports. 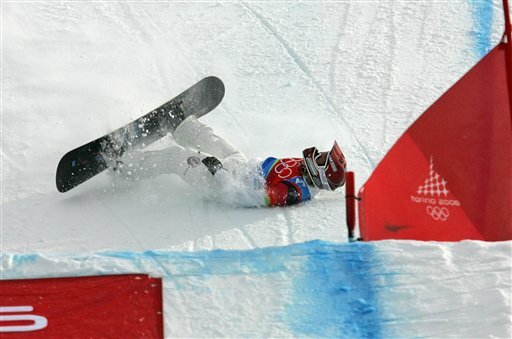 When I was younger, I used to watch the Olympics in hopes of seeing some good wipeouts. Okay, I still enjoy a bit of that from time to time. But, in recent years I have gained a new appreciation for the games. I watch it for the stories. The behind-the-music-esque biography segments intensify the drama. I like watching someone compete when I know a bit about them. We (my family and I) like to call them by their first names and cheer them on. My favorite story over the last few days has been that of Lindsey Jacobellis. This 20 year old girl was snowboardcross’s golden child going into the Olympics. However, after her crash and burn on the 17th, people have been talking smack about her. Lindsey was a considerable amount ahead of her would-be second place opponent in the race the other night (approx. 50 yards). However, the Olympic favorite—about 100 yards from the finish line—grabbed her board and hung mid-air like a blonde, bundled Michael Jordan in his glory days going for the dunk. Lindsey did a Method (the name of the trick) in the in-zone and bit it big time when she hit the ground. With the end in sight. With the swiss miss Tanja Frieden bolting past her hands over head with a blinding smile. Ouch. I jumped off the couch twice. Seconds apart. The first jump was in support of the Method yelling something like, “Go Lindsey! That’s awesome! That’s so rock and roll!” My next shout was, “No, Lindsey! You showboated!” Seconds later the commentators started using the word “showboat” to describe the scene to which my wife responded, “did you say that first or did they?” I did. Now, I have had a few days to reflect on Lindsey’s final touches to a fairy-tale run with a not-so-happy ending. At first, I was disappointed in her. I mean, we want our team to win. She had a chance to go Gold and with a stupid stunt took the silver. Today, I feel differently. Lindsey was celebrating! Who wouldn’t take the opportunity to perform a simple trick—a common snowboarding spectacle—in the final stretch of the biggest race of their life? I would! You would! Why not? She had a clear advantage. She raced hard. She was “tasting blood” from working so hard for crying out loud. This is the kind of thing (the tricky maneuver) we celebrate all the time! We love the risky three point shot. We love the stage dive from the top of the stack. We love the Hail Mary. I used to love how Chris Webber (a few seasons ago) used to make that don’t-mess-with-me-face when making stupid shots for the Kings while going up against Shaq. We never make fun and point the finger at these people when they make it—when they land it—when they stuff it. But, man do we crucify them when they don’t. I love to win. I do. I am hyper-competitive. But, dang. She was enjoying the moment. She was enjoying the ride. Is it ALWAYS about making the goal? Can you only celebrate once you have sealed the deal? Is Lindsey somehow not a great snowboarder anymore? Or, can we chalk it up to bad luck. Maybe it was bad timing. Or poor judgment. Youthful ignorance. Yada, yada, yada. Give her a break. I hope she doesn’t let this define her life. If Lindsey would have landed and won the gold, there would be songs in her honor. The talk around the water cooler would be complete with idiots grabbing their heels and laughing as they impersonated her victory ending while high-fiving one another. That’s just not fair. Good run, Lindsey. Good game.